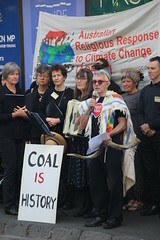 In the cold and early hours of December 3 2013, people will gather in Ballarat to commemorate the 159th anniversary of the Eureka Rebellion. It was a battle lost at the time in 1854, a slaughter by troopers and police of those who stood their ground for basic rights, but it sent ripples through the colony of Victoria and across Australia at the time. Indeed the event was talked about internationally. 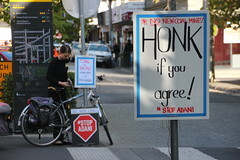 Like a rock skipping upon a lake it continues to ripple through time affecting how we interpret rebellion, protest, the social democratic and direct democracy traditions here in Australia. 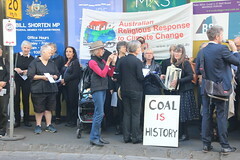 The 4am vigils at the Eureka Monument on the morning of December 3 usually attract about 50 people, from around Australia and even a few international visitors. 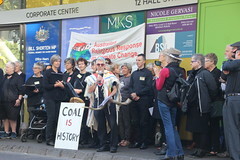 Over the last few years West Papuans have joined the vigil and the activities during the day. The events have a raw meaning in their fight for justice and independence for West Papua. 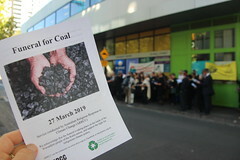 As in previous years, the vigil will be broadcast live on Melbourne community radio 3CR from 4am to 6am. facets of the celebrations. Mr. Jacob Rumbiak, the Foreign Minister in exile, will be coming to Ballarat to receive a Eureka Australia Day Medal for the personal sacrifices he has personally made (imprisoned for 10 years, tortured by the Indonesian authorities). He fled to Australia in 1998. He is the senior member of the West Papuan Independence Movement who is currently not in an Indonesian prison. The commemorative dinner on Tuesday evening will feature The Black Orchids, a West Papuan Independence band. The dinner will also feature local respected Ballarat historian, Dr. Anne Beggs-Sunter, who will be giving a talk about Eureka plays and films. 7:00pm – 10.00pm Ballarat Eureka Commemoration Dinner – Eureka Stockade Hotel, 152 Eureka St – Guest Speaker Dr. Anne Beggs-Sunter on the topic of ‘Eureka plays and films over the years’ Entertainment: West Papuan Independence Movement music and song. Booking essential 0439 395 489 close 2 December. Mr Dunstan expects that about 150 will gather at 4 am Tuesday 3 December for the Eureka Dawn Service at the Eureka Stockade Memorial, cnr Stawell and Eureka Streets, Ballarat. 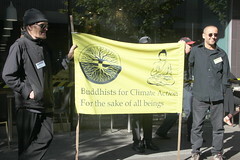 “In a time of widespread dissatisfaction with Parliamentary politics and a myriad community based protest groups which are out to save ground water from CSG miners, forests from coal pits, the Reef from coal ports, food from Monsanto GM crops, whistle blowers from Grand Juries, West Papuans from Indonesian oppression, Australians from more US wars and so on, the Eureka rebellion story takes on a special resonance and the Eureka Dawn Service, a special solemnity for activists,” he said. 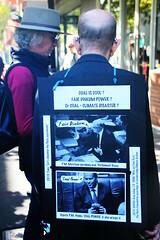 Last year it was an effigy of Major General Michael Krause who Mr Dunstan describes as the door opener for the US Marines occupation of Darwin. 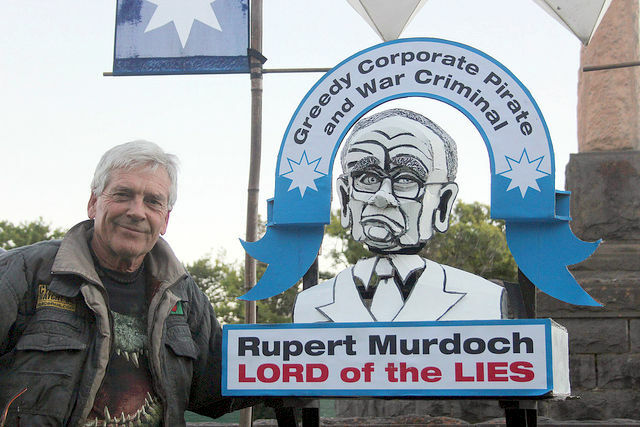 Although only a week out from the event, Mr Dunstan has yet to decide who his effigy will depict at next Eureka dawn. 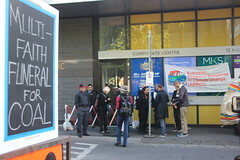 The Anarchist Media Institute has been holding Reclaim the Radical Spirit of the Eureka Rebellion Celebrations, in Ballarat on the 3rd December, since 2002. Over the past two years West Papuan Independence activists exiled in Australia have been attending the celebrations in greater numbers. The West Papuan Independence Movement identifies with the universal values that propelled the Eureka Rebellion. They identify with the aims and principles of the Eureka rebels. December, Eureka occurred on the 3rd December. 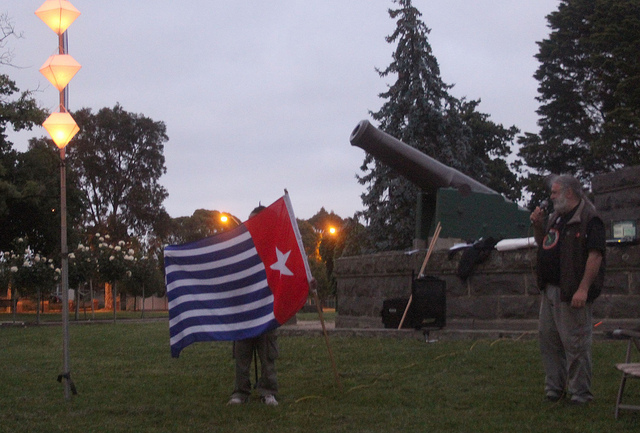 The Morning Star is the principal feature of the West Papuan Independence Movement, while the Southern Cross is the Eureka Rebellion’s primary symbol. The Black Orchids, a West Papuan Independence band, will be providing the entertainment at this year’s Reclaim the Radical Spirit of the Eureka Rebellion Celebrations’ Annual Dinner, at which local respected Ballarat historian, Dr. Anne Beggs-Sunter will be giving a talk about Eureka plays and films. 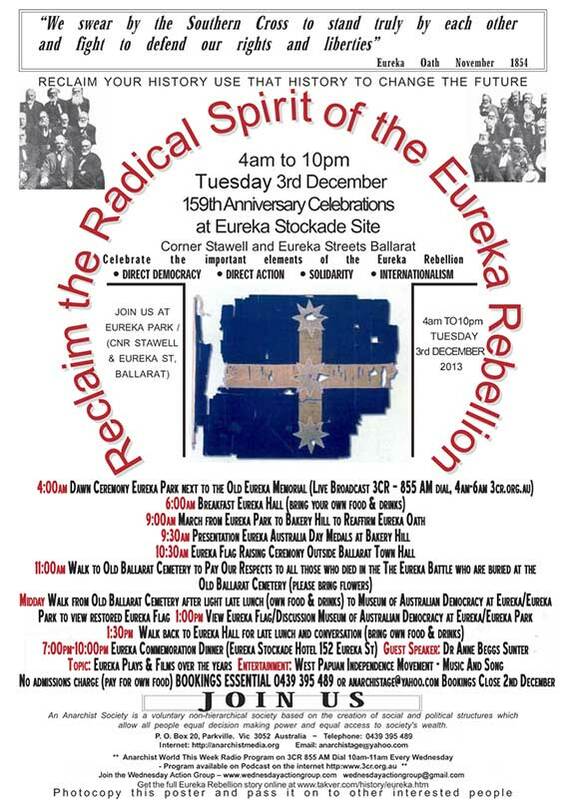 If you require further information, contact Dr. Joseph Toscano, the Convenor of the Reclaim the Radical Spirit of the Eureka Rebellion Celebrations directly on 0439 395 489 to learn more about the scope of celebrations in Ballarat that begin at 4:00am and end at 10:00pm.